TORO, a leading worldwide provider of innovative turf and landscape maintenance equipment, and precision irrigation solutions, helps their customers care for golf courses. 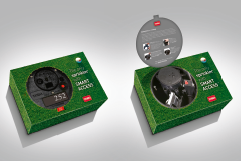 For the launch of their revolutionary low-maintenance Infinity sprinkler system, TORO asked Centigrade to develop a direct mail campaign aimed at head greenkeepers of the top golf courses in Europe. 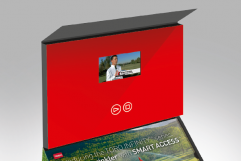 Centigrade developed this unique direct mail piece showcasing the main features of the new sprinkler system, including, in the lid, an increasingly popular video-in-a-box screen describing the product, with testimonials of happy greenskeepers. The box also contained greenskeeping related gifts and a catalogue of the extended product range. 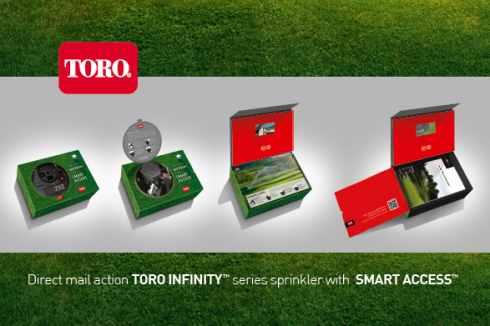 A reply mechanism allowed greenskeepers to order four Infinity sprinklers, allowing them to test in situ.